I got home from work at 10 pm last night and since I only was able to eat at 10:30 pm, I didn't sleep very well. And I was back to work at 7 am today. I think if things aren't too crazy today I will leave early and go to the gym for an hour to relax a little bit. I cannot wait till this week (and our crazy work rush) is over and I go to TO! 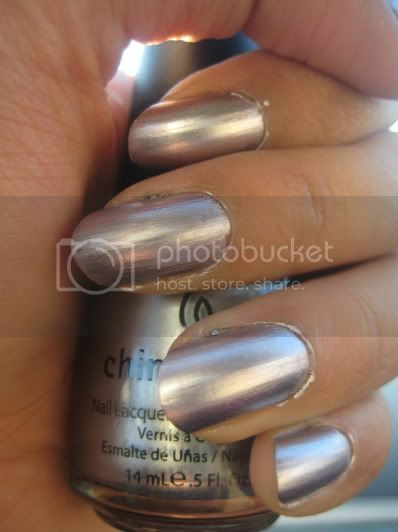 I'm wearing China Glaze Sci Fi on my nails from their Krome collection. It's a beautiful metallic nail polish that looks silver in dim light but during the day it definitely has a lilac touch to it. It even looks like a silvery blue under some light. I looooove this colour, it's totdally me and it applied so well. I can see me wearing this a lot (though I say that all the time, but I have so many nail polishes that I don't wear anything a lot!). 4 Responses to "Sci Fi"
Your nails look so nice; mine look all lumpy under all of the CG Khromes! Beautiful...I just LOVE these polishes. Hopefully I'll be able to make a haul soon, but I'm holding out until I can get Xmas shopping done. Gildedangel - thanks :) have you tried buffing your nails? I was actually quite blessed in the nail department but my sister who wear a lot of metallic polishes always buffs hers. Shayla - thanks :) which ones are you getting?